Reed diffusers offer another home fragrance option to scented candles. Although reed diffusers aren't as expensive as they once were, you may still wish to learn how to make these items yourself. Learning how to make reed diffusers is not difficult and it gives you the chance to create a completely customized fragrance experience for your home. Reed diffusers are also great to give as gifts to your family and friends. Mix a solution of 1/3 fragrance oil, 1/3 vegetable oil, and 1/3 budget vodka, filling the bottle approximately 2/3 full. Insert the bamboo skewers, flipping them two or three times to make sure the oil is completely absorbed in all parts of the skewers. 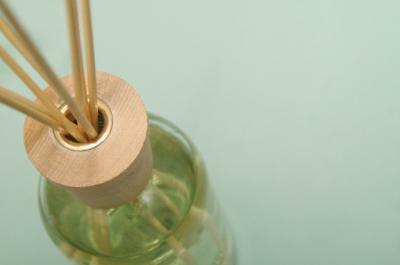 Place your reed diffuser in a spot where it won't be tipped over. Whenever your fragrance needs refreshing, simply flip the skewers over to add a fresh boost of scent to the room. If you enjoy making reed diffusers and have a worthy charitable organization you'd like to help, keep in mind that homemade diffusers are excellent fundraising tools. Instead of buying magazine subscriptions, wrapping paper, or overpriced candy, people will be happy to purchase a useful and attractive reed diffuser for their home. To learn more about using reed diffusers as a fundraising tool, visit LoveToKnow Charity.